When I first became interested in my physique and trying to bulk up a bit, I didn’t know where to start, and I’m pretty sure I’m not only one. I was a complete novice. I’d only been going to the gym for a few months and didn’t really know what I was doing. I did the same workouts on the same machines every time (the ones away from the big lads). Naturally, I’m quite a skinny guy, I’d never used supplements before, but I knew to gain weight and muscle, I had to change things up and get more protein in my body through my diet and with protein powders. I asked people about what type of protein powders I should be taking for the best results, searched Google for the best powders for beginners and of course watched many different YouTube videos about protein. I heard words like whey protein, pre-workout, post-recovery, alpha proteins, carb loading, macronutrients, casein and a whole load of others. Things got confusing, but I got there in the end. I think you’ll agree that choosing protein powder isn’t all that easy. So I want to help you out and share what I’ve learned about protein help you find the best protein powders to buy. Here’s my list of the best protein powders, why I like them and whether you should give them a try or not. I’ve broken these down into different categories such as the best tasting protein powder, the best protein for weight gain/loss and a few more. All of these products are discussed in much more detail later in this post. Will Protein Shakes Help You Build Muscle? It takes hours of research and an incredible amount of nutritional understanding to get the right brand and the right kind of protein to suit your specific dietary requirements for example, if you follow a paleo diet you will be looking for the best paleo protein powder. And that’s what most people think. It is also important to consider preworkout supplements, to help maximise your workout. What I’ve found (and I did this too) is that most people who are just getting into working out or lifting weights focus on the wrong aspects. They get all caught up in the best protein shakes, the optimal time to take protein powders, and what variety of proteins they need. Beginners focus too much on the details and the minutiae. I know this is supposed to be an easy guide to protein powders, but I’m going to shock you here. It’s not actually that hard! Once I learnt which type of protein I should be taking, I asked for some recommendations, bought it, had a read of the instructions on the packaging and that was me sorted. You need to determine which type of protein you need. This is decided by what your goals are: extra mass, lean muscle, strength training etc. Below, I’m going to break it down step by step, and I’m going to walk you through what are the best protein powders out there. I’m not going to assume that you have all this previous information about protein powders. If you already know about protein powders and you just want to get to the meat of the article (pun totally intended), skip this section. But if you’re a complete beginner, keep reading. Protein powders give you the boost of protein your body needs after strenuous exercise. When you work out, you’re causing microscopic tears and fissures to your ligaments and muscles. You’re damaging the very structure of your body. But wait, that’s a good thing. Protein is the key building block that is used in the production of muscles. Your body takes the protein from the food you eat and makes hormones, enzymes, immune response cells, and so much more. And it also builds up your muscle tissue. Protein not only builds up your muscle but prevents you from causing injury when you work out next time. It’s not just to get you “swoll”, it’s to prevent you from being stretchered out of the weight room. So, why take protein shakes? Well, you could take your George Foreman grill into the weight room. You could finish up your workout set with a grilled chicken breast and a side of chickpea salad. But I doubt Gold’s Gym looks kindly on that idea. Or, you could indulge in a protein bar to consume the necessary nutrients. Protein powders make it easy on your body and your schedule. Your body doesn’t have to break down the food to access the protein molecules in the cells, and if you can get plenty of high quality protein when you’re out and about. With a powerful protein powder, you can get instant access to all that wonderful, sweet protein powder goodness to rebuild those aching, hurting muscles. And the faster your body can get that nourishing protein, the better it can rebuild. Most people believe that there is a 45-60 minute window after a rigorous workout where you get the most effective results from taking protein powders or shakes. It’s when your body is injured that it’s searching out proteins to rebuild and heal as fast as possible. I mean, I could get into the body’s muscular structure and molecular compounds of proteins, but it’s not necessary here. I think your eyes would glaze over if I tried. So, let’s start to look at the protein powders you should be paying attention to for your body’s best performance. Of course, you can certainly build muscle by eating right and working out. Lifting weights will add mass to your body. So, why bother taking protein powders? It’s because you want to gain mass fast. You want to see results quicker than if you didn’t do it at all. Look: Protein powders can help you gain muscle mass faster, but they’re not the be-all and end-all. They’re simply a tool to get results faster and to target the kind of results you want. So what do you want? Do you want to gain weight? Do you want to bulk up? Protein supplements will get you there, that’s for sure. Protein powder can actually help you lose weight. You never actually feel full after having a couple. You can easily slam back a pack of Oreos or a bag of crisps without really feeling satiated. You could always have one more. But can you continually eat steak or chicken? Can you keep on smashing as much as you want? No. By the time you take a few bites, your body starts to experience that satiated feeling. Your stomach sends signals to your brain that you don’t need to feel hungry anymore. That is caused, in part, by the protein in your food. It regulates the weight hormones in your body and alerts your brain when you’re getting enough food. Here’s what this means for your weight loss: You can use this part of your brain to your advantage. By taking protein powder, you can curb your diet and feel fuller with the right type of protein intake. What’s the best protein for weight loss? Studies show that whey protein helps your body feel full after ingesting it. Obviously, the best weight loss is eating right and exercising. But if you need to get on top of your eating habits and want to curb your appetite, whey protein can help. Use a whey protein like MyProtein Impact Whey which has only 1g Carbs per serving. It’s pure whey protein, giving you the maximum effect to reduce your body’s hunger stimulus. After trying several protein powders, this is the one I use now on a daily basis when trying to add bulk and muscle too. I started out with the unflavoured powder and adding a banana but I moved on the chocolate brownie flavour and I love that. It’s genuinely nice to drink, I’d happily drink as a regular milkshake. I’ve started to add the chocolate brownie powder into porridge and pancake mix too recently, which works really well and is a fun way of getting more protein. I first selected the MyProtein Impact whey because of its reviews for high quality protein, scoring in the top 10 for quality for all protein powders on LabDoor – scoring 83.6/100 in their quality rankings. I find that when I’m using the MyProtein as part of high protein diet – usually 30 minutes before or after hitting the gym – I gain more muscle, size and my recovery is much quicker too. I’d highly recommend this powder. Especially the chocolate brownie flavour. It’s also one of the cheaper options too! For your money, I’m going to suggest a brand that does a lot of different flavours. BSN Syntha-6 has a wide range of products, but their Chocolate Milkshake flavour is the best tasting chocolate protein I’ve tried. I’m pretty partial to the chocolate milkshake taste, it’s actually great to taste. If you’re keen on getting a great source of protein in a chocolate flavour you love, go for this brand. I think the reason that chocolate protein works so well is that the taste of chocolate just overrides anything else. It covers up all the parts you don’t want to taste while giving you an instant hit of a flavour you know and that you already love. If you’re not a fan of taking a protein powder shake straight up, let me make a suggestion. Add a banana to the mixture and that will help with both the texture and the taste. It will feel like a chocolate banana smoothie while also giving you the best protein for your muscles. Side note: Chocolate milk is actually a great source of protein as well. I’ll get into the why further on in this article. It’s worth noting that it is good, but there’s a high sugar content as well. Use sparingly. Side note: Part 2: The BSN range also includes a peanut butter chocolate variety. Peanuts and chocolate…and it’s good for me? Sign me up. You can check the latest price of BSN Syntha-6 here. Did you know that you can use protein powders in your baking? It’s true. You can make protein powder cookies or protein balls that you pop after your workout. It’s much easier than mixing up liquids on the go, and it works well in a cookie form. So, although I’m not a vanilla fan, myself I have heard great things about Optimum Nutrition Gold Standard Vanilla Protein Powder. It’s a respected brand of protein supplement so it’s worth noting it comes from a reputable background. One of the best markers of this protein powder brand is that it comes with an exceptional rating of like-minded protein powder users. The online reviews far eclipse what others brands offer. One of the hardest parts about getting fit is giving up on all those foods you used to love. That’s why I’m a fan of the O.N. brand. They brought vanilla ice cream into your diet and made it good for you. They also offer variations like French Vanilla Crème and Cookies and Cream. Protein powder just doesn’t have to be boring anymore. If you’re partial to berries, you’ll be happy to know that ON Gold Standard also does a Strawberry variety. It’s perfect for adding to smoothies and shakes. I know that unless you’re serious about weightlifting, you’re probably going to want to mask the way you intake your protein requirements. Adding protein powder to shakes and smoothies helps the medicine go down. Make a fruit smoothie using the strawberry flavour as your base. You’ll enjoy the benefits of protein after a workout and a fruit flavoured drink at the same time. Of course, it’s hard to stop there. Listing all the flavours you can find would be nearly impossible. You can get Caramel Toffee, Fudge, Chocolate Mint, Brownie, Banana Cream, Rocky Road, and White Chocolate Raspberry. Like I said earlier, protein powders don’t have to be a chore. In fact, make these protein powders your treat for finishing your workout and you’ll always be happy to get into the gym. Find the latest price of this here. If you’re looking for a protein powder to help you gain more mass, you’d think a powder called ‘Serious Mass’ would be a good one to check out. And you’d be right. When I first discovered the Optimum Nutrition Serious Mass I had to double check that I was reading the values correctly. 50g of protein and a whopping 252g of carbs in every serving. Huge numbers. I wouldn’t recommend this if you’re brand new to supplements or lifting, we’ll come onto a more suitable supplement for you guys in a just a moment. But if you’re hitting the gym regularly, your lifting is getting heavier, your diet is strong but you’re struggling to take the next step, this is when I’d look at adding Serious Mass into your diet. Sometimes it’s hard to eat enough to gain the extra calories needed to gain mass, especially if you’ve got a 9-5 job and you’re not able to whip up a full meal for breakfast, lunch and dinner. With Serious Mass you’ll be adding 1250 calories with every shake, and as we’ve mentioned, whale sized portions of carbs. Not literally. You can see the availability of this here. If you want to get bigger muscles, you need to do more reps in the weight room. It’s a fact that your muscle size is directly connected to the reps you can push out in the gym. Get this: There’s one supplement that is favoured above all others for building up muscle mass. And it doesn’t just add size to make you look good. It powers the fast-energy tissues in your muscles that you need to get that extra few reps out. Creatine powder directly targets the part of the muscle that needs the energy to keep pushing through. Men who take creatine rapidly see increases in muscle size, even if they’ve plateaued for a while at a certain weight. For my bet, I’d recommend a dosage of Muscleform Micropure Creatine. It gives you that boost of high energy impact in the gym and a burst of size outside the gym. This is by far the cheapest powder on our list too. Get on it. You could think looking at our individual ratings that an overall score of 4.5/5 is incorrect, but when it comes to casein, things are slightly different to whey. Casein is much slower burning, your body doesn’t use it up straight away – and you don’t want it to either. You want the casein to stay in your system for longer, being used by your body slower. Casein powders are normally more expensive than whey proteins, but the USN Ultra Premium is very well priced for a high quality casein powder. There are no secret pills to gain mass (well, there are but they’re illegal). It’s a simple case of getting more good calories into your diet. You need to build up the amount of intake while working out to burn that excess energy, not letting your body store it as fat. The problem with some of these protein powders is that they can be thick and filling. After having one, you won’t feel like eating again for a while. I’m going to introduce you to casein. Casein is a protein powder that works in tandem with whey powder. Casein still boosts your protein intake so that your muscles can build on what you’ve got. You can also rely on casein to do one more thing. It doesn’t leave you feeling full. You can have your protein powder, and not feel like you’re going to burst after the protein shake. For skinny guys looking to bulk up, protein powders like the one offered by USN Night Time Casein are good sources of casein. Find this on Amazon to check the latest price. We’ve covered muscle mass gain and fat loss. Protein has a miraculous ability to target your body’s response to build up muscle and use stored fat as energy sources in your body. But you may be wondering: What about all us vegans? I know that a HUGE portion of the fitness fanatics out there are extremely conscious about what they put in their bodies. If you’re practising CrossFit, protein powders help energize you and build up your strength. But if you’re avoiding animal products, you need to be extra aware of the type of protein powders you’re taking. If you’re using a vegan protein powder as a supplement to your diet, you should know that there is a huge range of plant-based protein powders that don’t have any milk or animal products in them at all. Plant-based protein powders, like the NutriSport 90+ Vegan Protein Powder, use rice, peas and soy to isolate the protein chains. One of the benefits of choosing a vegan protein powder is that you don’t have to worry about fat or cholesterol like you might in animal-based proteins. You also get the benefit of choosing a sustainable method of harvesting proteins. It’s safe, non-GMO, and has almost the exact amino acid makeup of a normal animal-based protein powder. Raw protein powder also isn’t exposed to any harmful chemicals during the processing of the pea plant. Each plant is subjected to pressure and water treatment to extract the proteins. It’s tough to find a decent-tasting protein powder, no matter where it’s sourced from. As I mentioned earlier, but there are a few varieties that I could call the best tasting vegan protein powder you can try. Garden Of Life produces an ethically harvested vegan protein powder that has a vanilla taste to it. It’s an entirely organic plant-based protein powder that uses natural extracts to flavour the powder. Reflex Nutrition also puts out a vegan plant-based protein that tastes like chocolate. Don’t even think about giving up chocolate. Each of these has a good selection of plants and minerals to satisfy your need for a vegan protein shake after a workout. There is one thing I should mention: Plant-based proteins do lack some of the rich minerals that you would normally find in a protein source like meat or a non-vegan protein powder. Make sure you supplement your diet with vitamins so you don’t miss out on vital nutrients. But of course, you probably already knew that. Getting to the gym can be hard. It takes time and energy and adding on making a protein shake can be a burden you’re not ready to take on. Here comes the pre-made protein shakes to save the day. You can still squeeze in your workout and grab a ready-to-drink (RTD) protein shake on the way out the door. 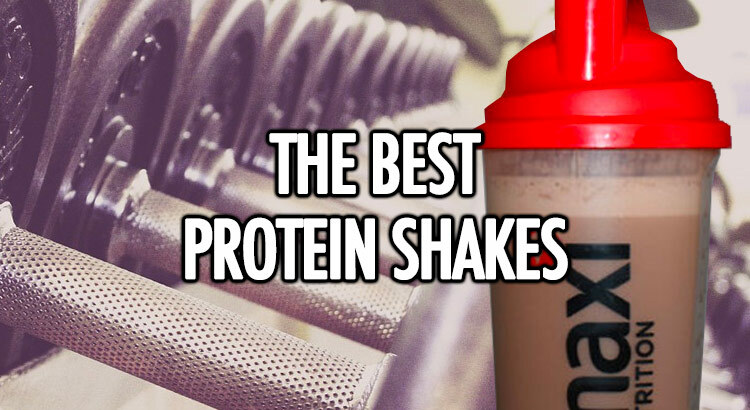 The best RTD protein shakes depend on what you’re looking for. Do you want muscle mass? Do you want to cut fat and build bulk? Or do you want to tone your muscles and get a stronger body? The MaxiNutrition Promax strawberry shake is great flavoured protein shake that you can put in your bag and drink on the go. It packs a hit of 30g of protein in the single bottle serving and hardly any fat. Dymatize also put out a smooth protein drink that is pretty good going down called the ISO100 Clear. I do quite like this one because it has no sugars or fats and each drink is 40g of pure whey protein in one hit. Just like with a camera, the best ready to drink shakes are the ones that you have with you. So, if you’ve prepared a protein shake before you went out, or you grabbed a pre-made protein shake on the way out of the gym, it’s still going to be good for your body. If you’re interested in your fitness at all, whether it’s performance or appearance, a protein shake should interest you. Use this as a guide, if you follow a ketogenic diet you may find out guide to the best keto proteins helpful. Bookmark this and come back to reference when you need to understand a certain milestone you’re trying to achieve. Don’t get bogged down in the details. I’ve made this as detailed as I can, but that shouldn’t distract you from what’s really important. Work on consistently showing up to the gym. Then work on your form before your performance. Once you’ve mastered those, you can move on to more complicated aspects. Protein powders don’t replace good, healthy habits. They boost your hard work. So, when you’re ready to put some punch into your workout, grab a protein powder shake on your way out the door. Great list! Like you say, protein powders are so easy to come across and prepare, and incremental to a good workout performance. There are plenty of ways to change up the flavours as well, and extra health boosts if you add natural yoghurts, fresh fruit, and nuts as well!